If you’re making amigurumi, there’s no gauge mentioned most of the time. This means you can use any yarn you like for this kind of crochet. Thicker yarn will result in a bigger softie, thinner yarn will result in a smaller stuffed animal. But is it really true that the yarn gauge doesn’t matter? Or does it? Every yarn has it’s own characteristics and gauge. Sure, also your own crochet style is important. But every yarn will give you a slightly (or dramatically) different end result. Don’t worry, this can be a very positive thing. This way your amigurumi will have it’s very own unique character. And isn’t that just what we love about handmade items? I selected 3 eco-friendly yarns and took them to the test. I used my Lennard the frog prince pattern to show you the different outcomes for these different yarns. All three these yarns are eco-friendly and are available in lots of bright and happy colors. You can buy the yarns reviewed below, by clicking on the yarn-title or the “BUY THIS YARN” link. This yarn is extremely fluffy and soft and will make your softie extremely cuddly. The stitches are wide, which results in an amigurumi that looks a bit chubby (but in a very good way). It’s a very delicate and luxurious yarn and this reflects a bit in the price. If you only want the best of the best, than this definitely is your go-to yarn. There’s a very soft twist in the yarn, which means you’ll have to be careful when you’re attaching your pieces. The yarn breaks rather fast if you pull it, but you can fix this by giving it a little extra twist now and then. For the frog I used the colors: “Pickle”, “Tomato”, “Dandelion” and “Drift”. Kitchen cotton is the perfect yarn for those of us that are on a budget, but still want to use environmentally friendly yarn. This yarn has a tall stitch definition. So you’ll end up with a tall and slink amigurumi. The yarn might seem a bit rigid at first, but I can assure you that the finished item will be perfectly soft for a stuffed animal. My son loved this yarn as much as the other yarns I tested. So don’t let the rigidness of this yarn scare you. What I also love about this yarn… it comes in a fantastic selection of happy and bright colors! The colors are gorgeous. And the names are really yummie. For the frog I used the colors: “Snap pea”, “Hot pepper”, “Vanilla” and “Citrus”. This is my favorite go-to yarn for amigurumi. The stitch width and height is in between that one from Blue Sky Fibers and Lion brand. It’s a very strong yarn, it has a soft touch and a lovely shine. The price is a tiny bit higher than Kitchen cotton, but still very affordable. One of the great things about this yarn, is that it also comes in XL and sports weights. So you can mix and match different weights in one project and stick to the same colors. For the frog I used the colors: “08 green”, “55 red”, “01 white” en “99 yellow”. Which yarn is your favorite one? Post your comment below. 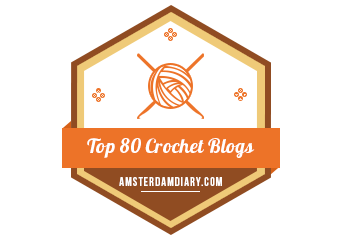 This blogposts has affiliate links with lovecrochet.com. « Pattern release! – Frog prince crown applique.